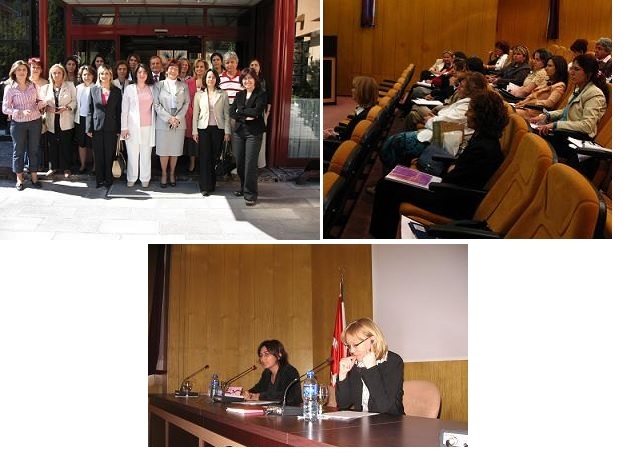 The second training of the project Strengthening Respect for Human Rights of Women in Turkey, conducted by Istanbul Bilgi University Human Rights Law Research Center and supported by Raoul Wallenberg Institute of Human Rights and Humanitarian Law and Swedish International Development Cooperation Agency, was held between 30 September-4 October 2006 in Ankara. Training seminars aims at promoting the elimination of discrimination and violence against women by means of training and awareness raising activities. Effective realisation of human rights requires a thorough understanding of human rights provisions relevant to their work among members of the judiciary, government officials, lawyers and the Turkish NGO community monitoring Turkey’s compliance with international human rights standards. The first of those seminars was held in 14-18 May 2006 with the participation of bar members from Egean and Meditteranean cities. 25 bar members from Central Anatolia and Black Sea region cities attended to the second seminar. The local experts were selected by Bilgi University and the international expert was selected by RWI. The local experts were Prof. Feride Acar (Chairwoman, Middle East Technical University, Department of Political Science and Public Administration, Ex-Chairwoman of the Committee on the Elimination of Discrimination Against Women), Assoc. Prof. Bertil Emrah Oder (Istanbul University, Faculty of Law), Assoc. Prof. Kadriye Bakirci, Istanbul Technical University, Faculty of Management, Assistant Professor Dolunay Ozbek (Istanbul Bilgi University, Faculty of Law), Ms Asuman Aytekin Inceoglu, LLM, Istanbul Bilgi University Faculty of Law and Ms Filiz Kerestecioglu, Member of Istanbul Bar Association. The international expert was Dr Miriam Estrada-Castillo, Legal and Political Adviser, United Nations, NY. The training lasted five days. The topics included in the training were: The status of international human rights instruments in Turkey, introduction to international human rights law, using international human rights standards to promote the human rights of women: key case-law demonstrating practical application of IHRL, the prohibition of discrimination under international human rights law: key principles and key case-law, the CEDAW Convention and the work of the CEDAW Committee, the prohibition of discrimination against women in Turkish law in the EU accession process: Progress and challenges, discrimination and sexual harassment at the workplace, the international legal framework on violence against women, violence against women in Turkey, with a focus on domestic violence, violence against women in Turkey, with a focus on crimes of honour, roundtable discussion on the role of lawyers in upholding human rights of women in Turkey: the participants’ experiences of dealing with cases relating to discrimination and violence against women, recommendations for action to improve remedies for discrimination and violence against women: roundtable discussion.